When disconnecting a car battery, remove the negative (black) terminal first, then the positive (red). Connect it in the opposite order. Positive, then negative. Most drivers have experienced the frustration of having a dead battery. 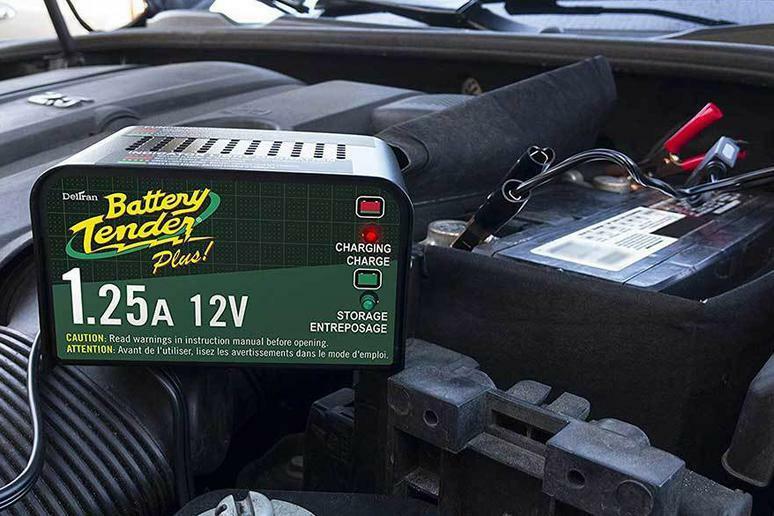 Fortunately, many modern car battery chargers offer an effective fix, not only restoring your battery to full power, but often the benefit of providing an emergency start function for your car. However, with numerous types of batteries available, and several options when it comes to charging them, the technology can sometimes be confusing. Our guide clarifies the differences and offers solutions to just about every charging problem. Basic trickle chargers are the cheapest type, with some costing under $10. They do a perfectly good job, but often take 24 hours or more. You can't leave them on, because there's a danger of over charging, and many won't work with Gel, AGM, or Lithium-ion batteries. More advanced trickle chargers, in the $15 to $30 range, have a maintenance or float mode, which keeps a battery in peak condition when it's not on the vehicle. They regulate themselves, so they detect when a battery is fully charged, and switch from trickle to float automatically. They can be left on for months at a time. Smart chargers range from around $50 to $150, sometimes more, and can offer a wide variety of functions and safety features. In addition to charging and maintaining batteries, some can improve batteries in poor condition, and repair batteries that would otherwise be considered dead. You usually have a choice of rapid or slow charging rates, and many have jump-start features that will get you out of trouble in an emergency. Volts: Chargers can be 12 volt only, 6/12 volt, or 12/24 volt. The only chargers capable of charging all three voltages are commercial models costing several hundred dollars. If you have numerous batteries to maintain and keep charged, it's probably cheaper to buy two consumer models. Amp rating: The amp rating tells you how quickly each device is capable of charging. Some trickle chargers are rated at less than 1 amp. Heavy-duty chargers can be over 20 amps. Standard car batteries range from 40 to 80 amps, and take charge at about 2 amps per hour, so you can see that with a very flat battery, a trickle charger might take a few days. A more powerful model could get it done in a few hours. Chargers with emergency start functions boost output to 40 amps for a few minutes, just to get the motor running. Batter chemistry: You need to check battery chemistry. Lead acid wet cell is the most common, but Gel, AGM, and Lithium models are becoming more widely used. Most smart chargers will cope with all types of batteries. Safety features: Lead acid batteries give off small amounts of hydrogen gas, so sparks can be dangerous. Spark protection is a feature on some chargers. Other safety features alert you if you put the charger's terminals on the wrong way (reverse polarity), and prevent overcharging. Alternator check: Some chargers provide an alternator check. A faulty alternator is a common cause of flat batteries. Q. Can I leave my battery on the vehicle when I charge it? A. You usually can charge with the battery on the vehicle with trickle chargers (sometimes called conditioning chargers) and smart chargers at slow charge rates. With fast-charging, it's usually recommended to disconnect the battery, but there are exceptions, particularly with those that offer a jump start option. Q. Is it better to charge a battery slowly or quickly? A. It's generally better to charge a battery slowly. A rapid charge usually generates significant heat, which isn't good for your battery's long-term health. It also retains more energy if you use a slow charging rate. Our take: One of the most comprehensive and effective battery chargers on the market. What we like: It has dual voltage, so it can handle car and truck batteries. Compatible with all battery chemistries. Repair function. Will not overcharge. Spark and polarity protection. What we dislike: Expensive. Some owners report durability issues. Our take: Trusted brand delivers excellent range of functions and great value. What we like: Works with almost all battery types. Switches automatically from fast charge, through top-off, to trickle. Clear charging status via LCD screen. 90-second engine start mode. What we dislike: Can indicate charged when the battery is still flat. Jump start sometimes unreliable. Our take: Plug it in, connect it, and forget about it. Efficient and safe. What we like: Charges and maintains batteries indefinitely with no risk of damage. Temperature compensation means it's always running at peak performance. Comes with alligator clips and ring terminals. What we dislike: No fast charge or jump start.